• Added newly designed title screen interface. • Added puzzle guides: switch on/off to display dotted line overlay. Easter 2015 giveaway - Free for a limited time! Do you have little ones learning to count? 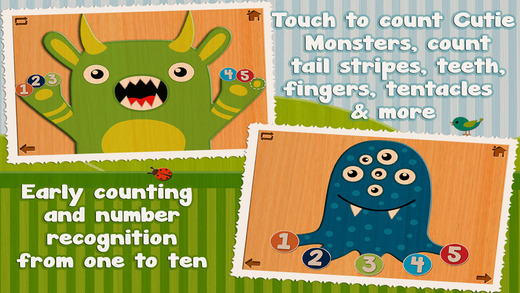 Join Blushy, Toothy, Golly, Taily, Blobby, Growly and other cute monsters on a fun introduction to the numbers 1 through to 10. • Featured on mashable.com,"Top Apps for Kids"
Cutie Monsters is a simple app designed specifically for the development needs of toddlers and preschoolers, simple jigsaw puzzles along with an interactive counting book will help children who are learning to count.